Pegged as the Heart of America, Sioux Falls proudly boasts it’s “at the center of everything.” With direct flights from more than 200 cities and an easy to drive to a dozen other states, they’re pretty much right. South Dakota’s largest city is the best-kept secret of the Plains States. That’s why we’re letting the cat out of the bag. With plenty of museums, restaurants, and affordable attractions, there truly is something for the entire family here. Pack your suitcases and let us show you what you can expect to find. Falls Park is the centerpiece and the pulse of the city. Today’s pioneers can enjoy exploring the landscape by bike or by foot on one of the many walking trails. Conveniently in the heart of downtown, restaurants and shops are easy to navigate. There’s a secret paradise awaiting at the Butterfly House. Rain or shine, winter or summer, more than 800 butterflies fly through the air, while just next door, hundreds of fish glide through the waters of the Marine Cove, South Dakota’s only salt-water aquarium. Between the kaleidoscope of colors within the tide pools and the flutter of wings, we have a feeling you’ll be instantly entranced. Even the teenagers in the family will crack a smile at Sky Zone as the giant indoor trampoline park promises hours of entertainment. From dodgeball games to the foam zone, you’ll have a hard time tearing the kids away from the action. 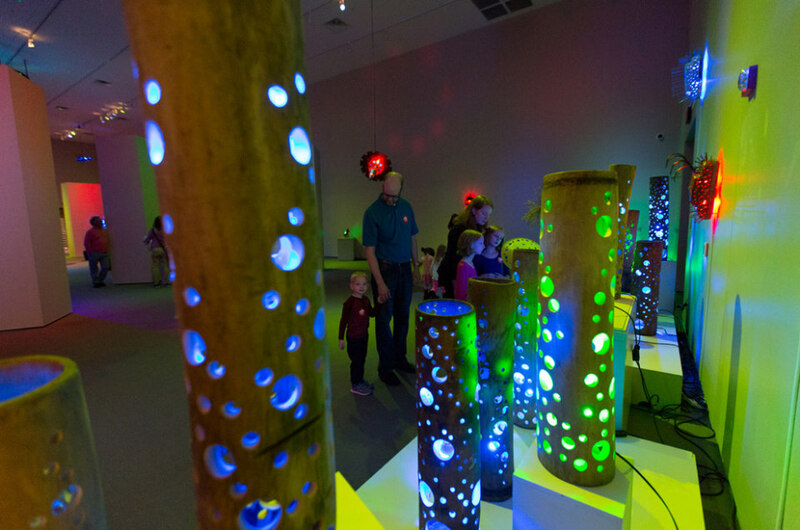 For a family-friendly evening outing, check their calendar for upcoming Glow Nights. Held most Saturdays, Glow Nights include black-lighting, neon clothes, and face painting. The last place most of us would expect to run into a giraffe would be South Dakota, but it’s an everyday occurrence at the Great Plains Zoo. After meeting the animals, you can learn more about their roles within the animal kingdom at the Delbridge Museum of Natural History. You definitely don’t want to miss the new baby rhino. Call it the pioneering spirit, but you’ll quickly learn there’s always a discovery to be made in Sioux Falls. No where is more appropriate to test that theory than at the Kirby Science Discovery Center. Far from your average museum experience, the Discovery Center has 100 exhibits about space, the Dynamic Earth, and Stan the T-Rex. The Outdoor Campus is a hands-on classroom in the Plains. The brainchild of the South Dakota Department of Game Fish and Parks and the Sioux Falls Parks and Rec Department, the Outdoor Campus is a collaboration to teach kids about camping, fishing, and even archery. All in all, a pretty awesome excuse to get even the tiniest of explorers outside.